All I ever think about is food. I jump out of bed, excited for breakfast: ahem, who wouldn’t be when these coconut lemon sweet rolls are ready and waiting?! But literally 5 minutes later I’m already thinking about what I’m going to make for lunch. After lunch? What’s for dinner? And after that, of course, is… what’s for dessert? I kid you not, I had this hot fudge sauce + ice cream every night last week. Then I go to bed and dream about new recipes. Lather. Rinse. Repeat. Food. Food. Food. Let’s rewind for a second though, because did anybody catch that? 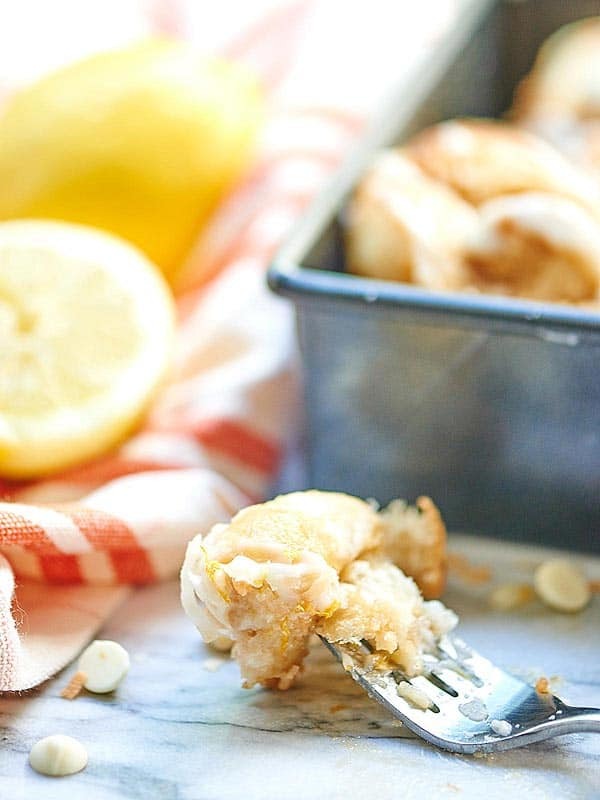 We’re talkin’ coconut lemon sweet rolls today and I am super pumped!! Coconut lemon sweet rolls may not be thaaaat exciting to you – oh who are we kidding, of course they are 😉 – but I’m extra excited, because I’m usually not a sweet rolls person. I’m more of a savory eggs, leftovers, or just skip it all together, breakfast kinda girl. I’m also usually not a fruit dessert or pastry person. Wait what? But hoooold up, because I’m a changed woman. I mean what’s not to love about a really tender sweet roll that’s stuffed with the sweet perfection we call brown sugar, fresh lemon zest, fragrant vanilla, and a hefty scoop of coconut flakes? It gets better, though. After the coconut lemon sweet rolls have done their thing (just a little resting, rising, and baking), they get smothered in a white chocolate, coconut, lemon, cream cheese frosting. Yeah. You heard me. Lift up your jaw before anyone notices. 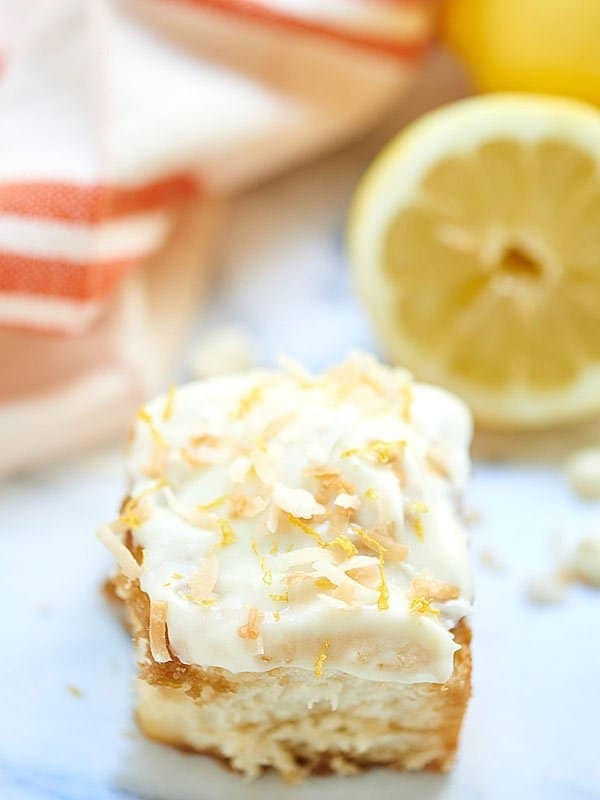 A subtly sweet, tart, fluffy white chocolate, coconut, lemon, cream cheese frosting. Like I said, this frosting gets smeared all over the hot-out-of-the-oven coconut lemon sweet rolls and it gets all melty and delicious. If you follow me on snapchat (dooo it, username: showmetheyummy) you got a little sneak peak of gooey deliciousness last week. 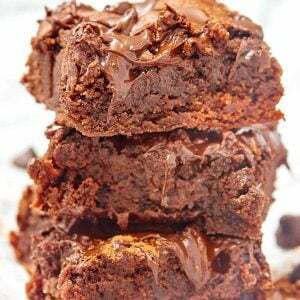 I served these with a homemade vanilla iced coffee and Trevor and I were in summer breakfast bliss. 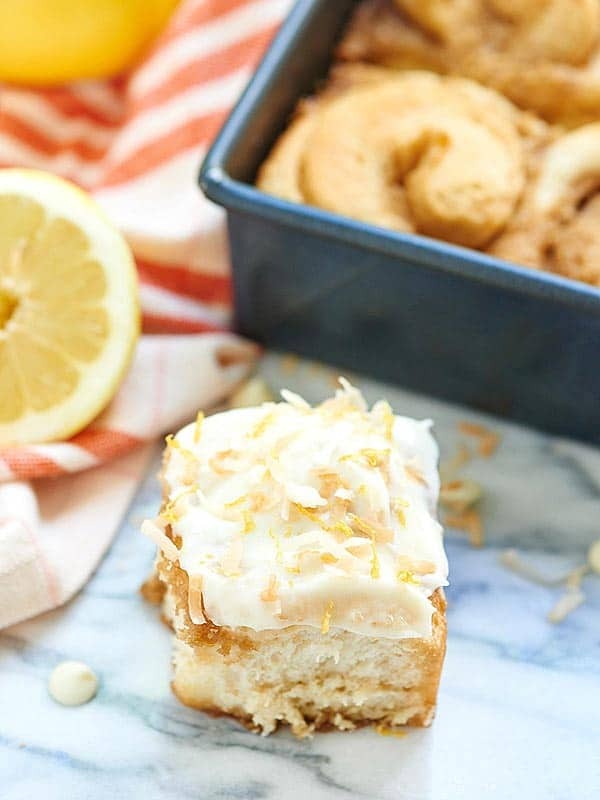 You can totally fork and knife these coconut lemon sweet rolls, but Trevor and I definitely dug in with our fingers and it was utter perfection. Except… hold up. I only got one bite, because I kindly asked Trevor to taste test, then I turned around for maaaybe a second and the roll was gone! Wah. Wah. 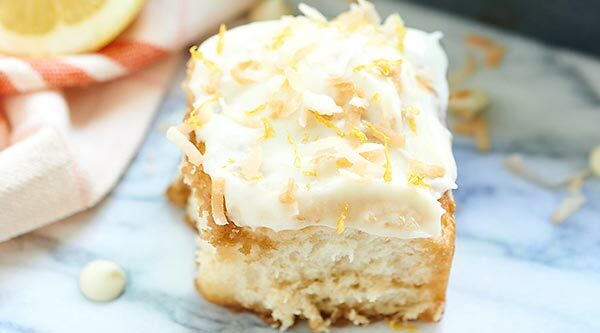 Coconut + lemon + a tender roll + a gooey, sugary center + white chocolate frosting. 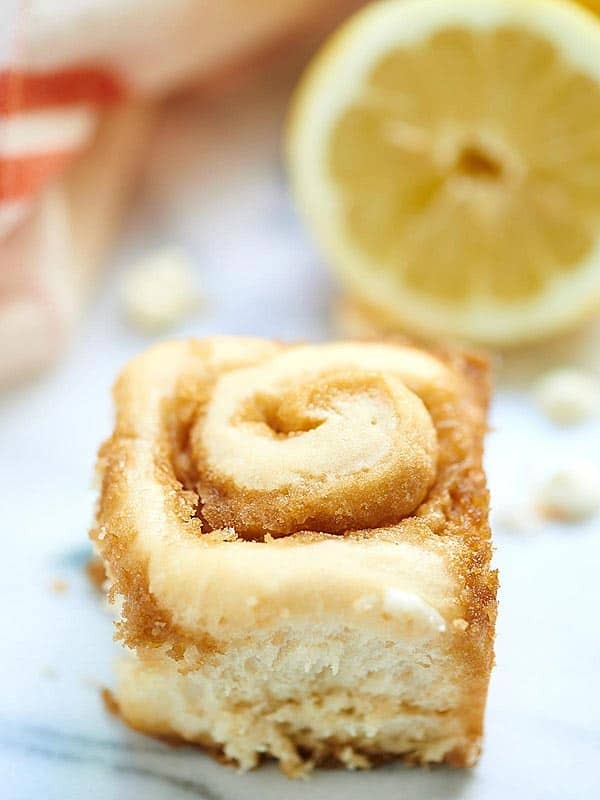 ♡ These coconut lemon sweet rolls have definitely converted me to a fruity, pastry, sweet roll lover! What’s your favorite sweet roll flavor? Orange? Blueberry? Show me the yummy! Coconut Lemon Sweet Rolls w/ a White Chocolate Coconut Lemon Cream Cheese Frosting. The perfect, summery breakfast. In a large bowl, whisk together the flour and salt set aside. 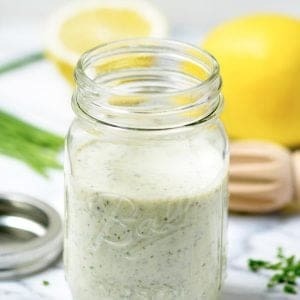 Heat the milk and butter together in the microwave until the butter is melted and the mixture is 110 degrees F. Stir in yeast and brown sugar. Let sit for 10 minutes. After 10 minutes, stir the milk/butter mixture into the flour mixture. Once the dough has started to come together, lightly flour your surface, and knead the dough for about 2 minutes. 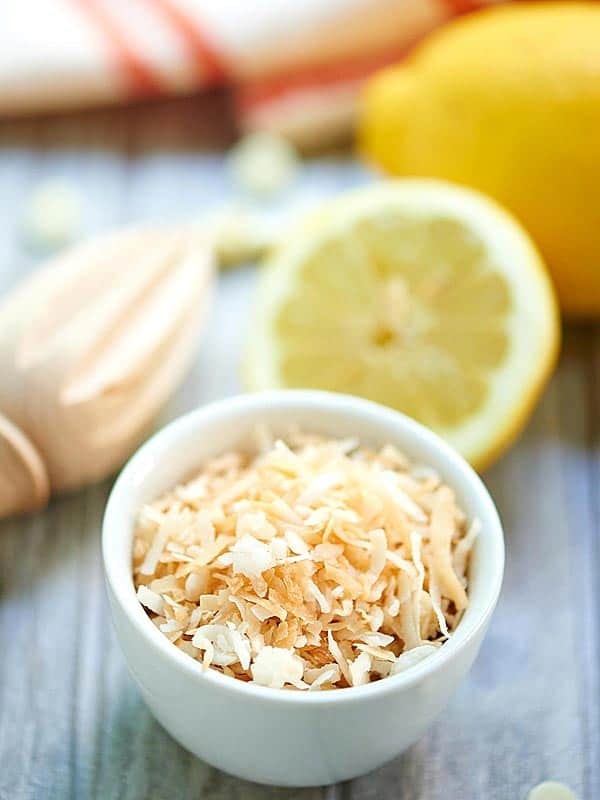 While the dough is resting, make the filling: In a medium sized bowl, stir the brown sugar, lemon zest, vanilla, and shredded coconut until well combined. Set aside. After the dough has rested for 10 minutes, lightly flour your surface again and roll it out into a rectangle (1/4 in thick). Using your hand (or a spatula) spread the butter over the dough and then sprinkle on the lemon sugar filling. Cut into 9 even pieces and place in a lightly greased 8x8 square pan. After the rolls have risen for 60 minutes, preheat the oven to 375 degrees F.
Bake for 15 minutes. Cover with foil and bake an additional 5 - 10 minutes, if necessary. Mine were perfect after 15 minutes. Let cool slightly while you make the frosting. Using your stand mixer, cream together cream cheese and butter for about 60 seconds, or until fluffy. 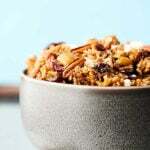 Scrape down your bowl. Add in lemon juice, coconut milk, and white chocolate. Stir until combined and then scrape down the bowl. 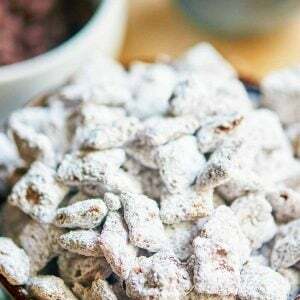 Add in the powdered sugar and beat until combined. Immediately frost the warm rolls and serve! These look fabulous!! What a combination, I am so craving one of these now! The answer is YES. Wait, what was the question? Oh yes, would I Like to eat my weight in these.